The past year has been a big one for local search. 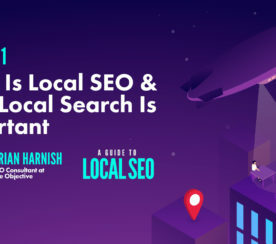 Google has remained the behemoth in local SEO, being heavily relied upon by businesses within organic results and Google Maps. In 2018, the Google My Business team have been testing and rolling out more new local search features than ever before. I’ve been documenting many of these changes, with some being more impactful than others. In this article, I outline the top 10 new features that you should be aware of, along with strategies for making the most out of each. 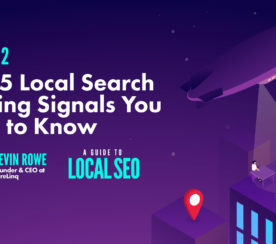 When Search Queries were first released in July 2018, it was a game changer for local SEO. Previously, it wasn’t easy to see for which keywords your Google My Business listing appeared. 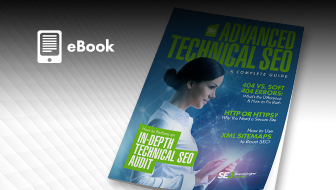 Your best data source was Google Search Console, which reports on traffic from both Google My Business and organic results. The old method, which involved using URL parameters, gave you “impression” data through Google Search Console (when your website appeared in a search result for a user). The new dataset in Google My Business, on the other hand, gives you the ability to see “unique users,” which is different than impressions because a single user could create several impressions. Google’s support Documentation suggests this data can be best used to create Google Posts and Ads. 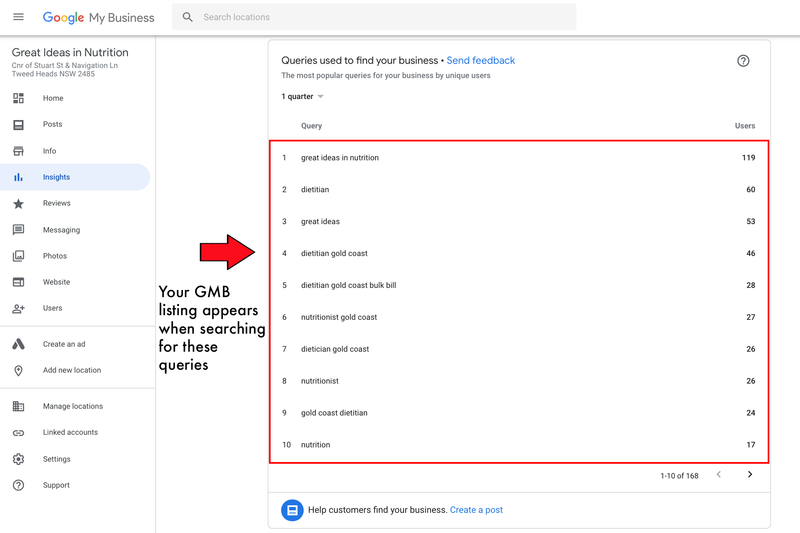 I’ve been using the data for on-page keyword optimization and ensuring that the queries relating to products and services are represented on the Google My Business listing. For example, if your customers are regularly searching for “trek bikes”, make sure there’s imagery of that product uploaded to your listing and outbound links developed directly to that product. Search Queries are by far the most exciting development to come out of local search in recent times. Make sure you’re taking advantage of this data! A new feature that is now available in select countries is the ability for customers to message businesses via Google Search and Maps. To activate this feature on your listing, you’ll need to first install the new Google My Business app for either iOS or Android. If you have multiple locations, open the one for which you’d like to enable this. Tap Customers > Messages > Turn on. You can now navigate to Customers > Messages to respond to any new messages (you’ll get a push notification every time you receive a message). This feature isn’t too prominent on listings just yet (not available on desktop), although I imagine this will become available in the not-too-distant future. Before enabling this feature, I would recommend having a process in place for the correct person to receive the notifications, and to respond in a timely fashion. Give your customers the ability to ask you a quick question that could result in a sale. Learn more about this feature. 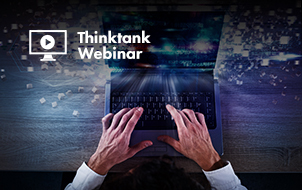 When the Agency Dashboard first rolled out to all users midway through last year, there were some bugs that made the transfer over from the standard dashboard very painful. Thankfully, many of those bugs have now been ironed out. The new dashboard is working as it was designed to. Transferring to this new dashboard was one of the best operational moves our SEO team made all year. 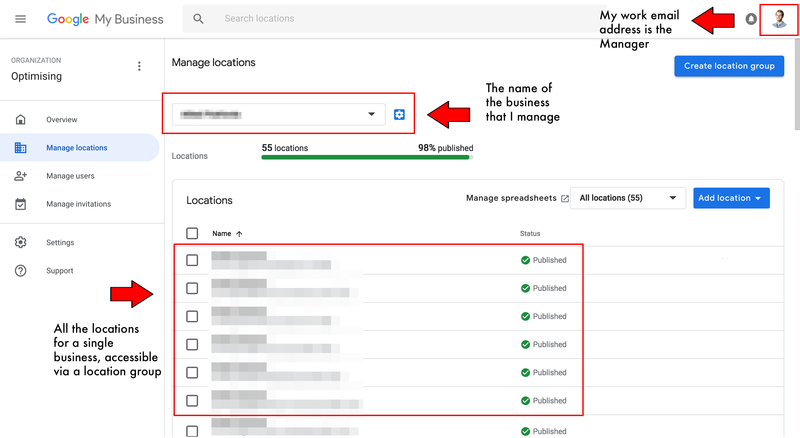 Instead of giving access via several Gmail accounts to our entire team, we are now able to assign certain location groups to our account managers. Not only this, we can now more effectively send and receive invitations to manage listings when we get a new client on board. If you work for or manage your own agency, then I’d highly recommend signing up if you haven’t already. On mobile, you can now make products visible on your Google My Business listing through a Products tab. 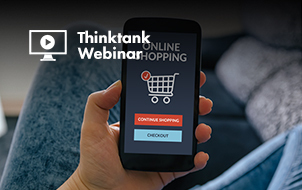 Depending on your listing category, you’ll have the capability to add a Collection of products to your listing with a call-to-action directing visitors to the corresponding product page. Through the desktop Google My Business dashboard, navigate to Products (Beta) tab. Give the Collection a name and description. Add a product with a: photo, product name, price, and description. Select Add collection to save. I’ve found this to be a valuable feature, as you’re now able to easily promote your products when someone lands on your listing, as if they were already deep on your website. At the moment, the product that you upload doesn’t appear on or influence Google’s search results. I would recommend adding your top selling products to your listing, although make sure to keep pricing up-to-date, if that’s something that varies from time-to-time. Just as restaurants are able to add a menu to their listing, you can now add your own services in a similar format. To see if this feature is applicable to your listing, navigate to Info within the dashboard and select Services. 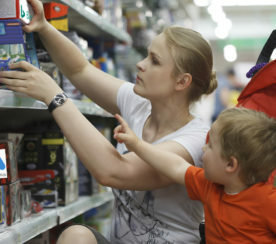 Similar to adding a Collection like you do with the Products tab, you’re able to add a section with whatever name you think is most suitable. For instance, I work with a dietitian consultancy that has this feature enabled. The section name I’ve used is Consultations. 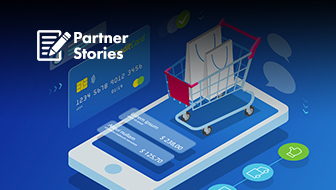 Unlike the Products tab, you’re unable to link directly to the corresponding landing page on your website through this feature, so make sure to provide all the necessary information when building out your offering. With Google Plus being shut down earlier than expected, the local team has started to incorporate some of those features across to Google My Business. This began well before the recent data breach, a clear indicator that Google had already planned to phase out Google Plus. For local businesses, having the capability to add a description to your listing is certainly a win. A useful application I found is adding your business’s email address to this section, along with what you offer, what sets you apart, and your history. There isn’t currently a feature within Google My Business to add your email address, so it only seems right to present this information here. It’s no secret that Google wants to compete in the social media space, they just haven’t quite found the right formula for success. One of Google’s recent attempts has been the incorporation of more social features within the local results and Maps. So far, we’ve seen the introduction of features such as Google Posts, Questions and Answers, and the ability to follow businesses on Maps. And just recently, I’ve seen Google test a “like” feature on Google Posts – similar to how you’d like a status update on Facebook. 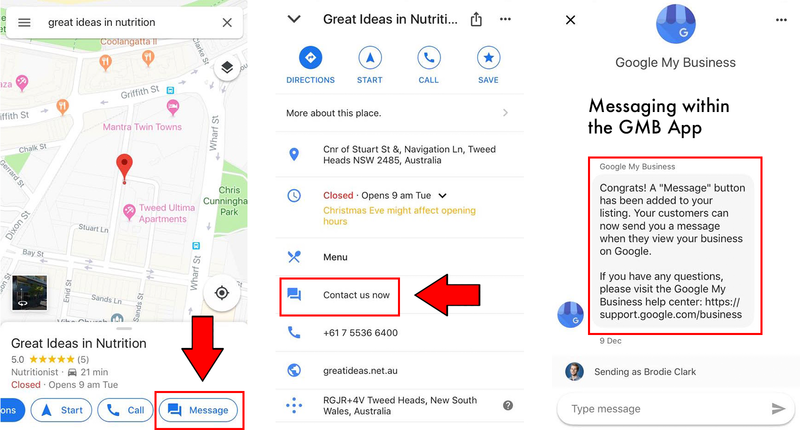 In terms of the “follow” feature, it’s recommended to investigate how you can get your customers to follow your business (when using Google Maps for Android at this time). You’re now able to use a variety of different calls-to-action within Google Posts. Along with promoting new articles through a “Learn More” CTA, I’m a big fan of creating an additional opportunity for customers to call your office (if that’s your preferred contact point). When setting up a Google Post with this feature, it defaults to the primary phone number set on your listing. 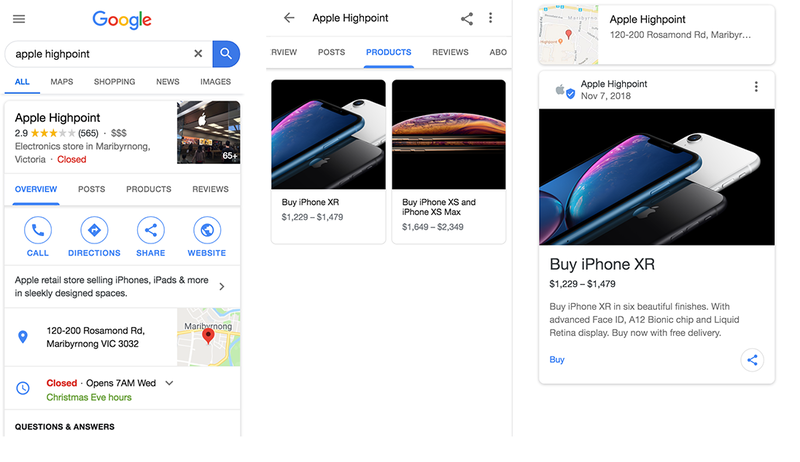 On mobile, Google Posts are now showing separate to listings for branded searches – with “Call Now” being a nice addition to the results page. Another new feature within Google My Business is setting a future opening date for soon-to-open businesses. All you need to do is select Verify later when you’re prompted to verify. Only the year and month of the opening date is needed, with the listing starting to appear 90 days before opening. The big benefit here is being able to create Google Posts, upload photos to your listing, and add a description to your listing – even if the business haven’t opened yet. Best to keep this knowledge in your back pocket prior to a new location launch. 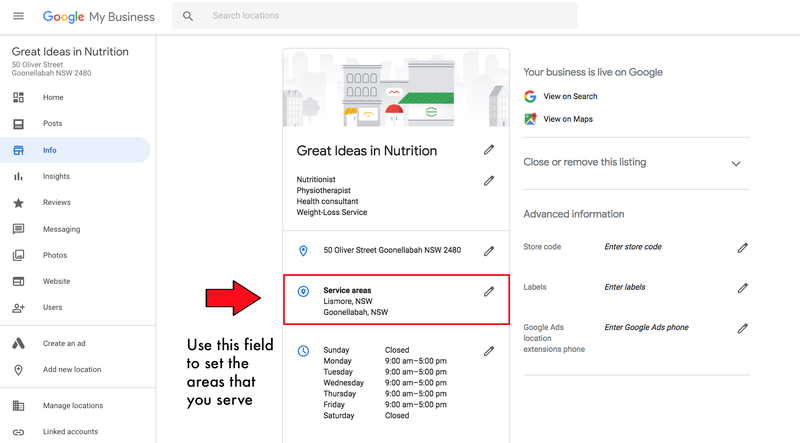 This new feature means that you’re provided with two separate fields in Google My Business to edit your business address and your service area. A business that visits or delivers to customers, but doesn’t serve customers at its business address (e.g., a plumber or cleaning service). A business that serves customers at its business address, but also visits or delivers to customers (e.g., a restaurant that also delivers food). This update means you’ll no longer be able to set a service area as a radius surrounding your listing. Instead, you’ll need to specify by region, city, or ZIP/postcode. Again, this is something that you should be aware of and use to its full potential – considering that the old method is now outdated. 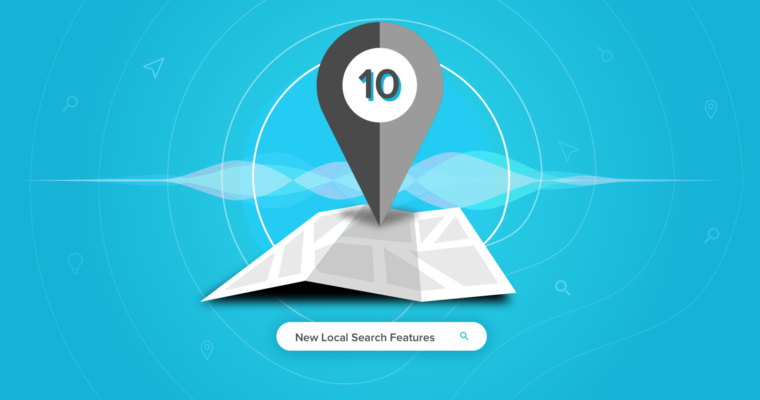 One of the more difficult and frustrating components of local search is that some features only apply to certain devices, business categories, locations, browsers, and applications (e.g., Google Maps or the new Google My Business App). The impact of Google My Business features as a local ranking signal is unclear, with the principles of proximity, relevance, and prominence remaining the core principles for local ranking. Ultimately, if you want to compete in local search, it’s important to differentiate your listing from your competitors. The 10 features discussed in this article will help set yourself apart from the rest.